Before the play scene opens, the audience in the theatre knows nothing of the interlude except that it is called The Murder of Gonzago, that it is 'something like the murder' of the late king, and that Hamlet himself has inserted a short speech in it. As John Dover Wilson points out, we know little of The Murder of Gonzago at the beginning of the mousetrap scene other than the fact that it is intended to parallel the murder of Hamlet's father according to the ghost's report in Act I. We can also surmise from the fact that it's in the traveling company's repertory and that Hamlet knows of the play, that must have enjoyed some popularity at the time. Most likely, the play is intended to make some reference to the Italianate revenge plays that were so popular in England at the time of the writing of Hamlet. 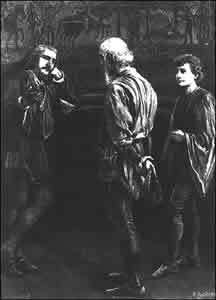 Arthur McGee, in his book, The Elizabethan Hamlet, further speculates that the events are based on real incidents in Italy, and came to Shakespeare through an Italian version of the drama. While the existence of real events that might have prompted the plot is a possibility, it seems less likely that an original Italian play is being referenced. The Machiavellian Italy to which McGee refers is more of an invention of the English imagination of the late 16th Century than a reflection of real politics in Italy. What is particularly interesting is that McGee speculates that the traveling theater company was a Commedia dell'arte troupe; one more accustomed to performing comic works than tragic ones. The murder of Gonzago was probably a reference to a real murder -- a Luigi Gonzaga murdered the Duke of Urbino in 1538, and it seems to be generally accepted that Shakespeare's knowledge is founded on an Italian original. Italians could and did poison each other as in the Gonzaga play -- they were Machiavels at heart, poisoners like the Borgias, libertines like the Venetians. -- Arthur McGee, The Elizabethan Hamlet, Yale Univ. Press., New Haven, 1987. pp.107-8. Tony Richardson seems also to have had something like a Commedia dell'arte troupe in mind for his 1969 production of Hamlet. This allowed him to dispose of the dumb show with a quick bit of stylized masked mime in the Commedia style.